Choice Future Planning has announced plans to create more than 100 jobs by April next year and more than double its contact cente workforce by the end of 2016. Choice Future Planning, which provides financial products for the over 50s, relocated from Shildon in County Durham to West Quay Business Village in Sunderland as part of its expansion; the company received support and advice from Sunderland City Council to find its new head office and successfully applied for a £400,000 grant from the Let’s Grow Regional Growth Fund to support the creation of 104 new contact centre based jobs. Choice Future Planning added 20 new staff in January, bringing its headcount to 53, and it aims to take on a further 20 people in April and 20 in September. Between January and April next year, it plans to create 40 more jobs. Director Adrian Holland said: “We specialise in later life planning – financial planning for people who are 50-plus. This is a large part of the population who have some very specific financial challenges. 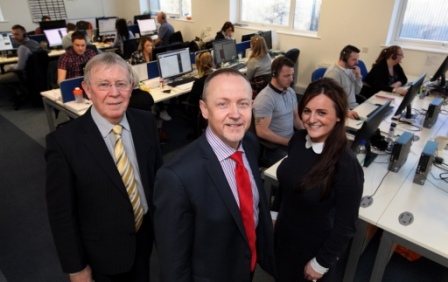 “We’re delighted that Choice Future Planning is bringing new jobs to the city and are pleased to have played a part in the company’s expansion by helping it to find the base for its future growth. “Sunderland is a can-do city and we have a great track record in supporting new and expanding business working here, and, as Choice Future Planning demonstrates, those seeking to relocate. 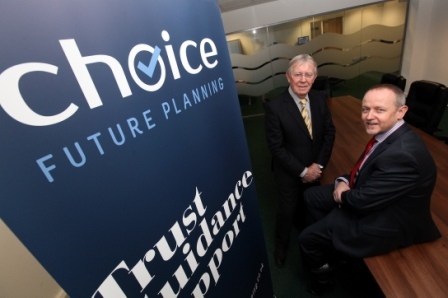 Choice Future Planning was established in 2014 as spin-off from Adrian Holland’s financial services business Kudos Wealth Management, which has been operating in pensions and mortgages since 1992. Choice started in offices in Shildon but moved its headquarters to Sunderland in January last year. (Top L to R) Cllr Harry Trueman, Sunderland City Council and Adrian Holland of Choice Future Planning. (Bottom L to R) Cllr Harry Trueman, Sunderland City Council with Adrian Holland and Kayleigh Johnson, both directors of Choice Future Planning. Be the first to comment on "Choice Future Planning to Create 100 Contact Centre jobs"